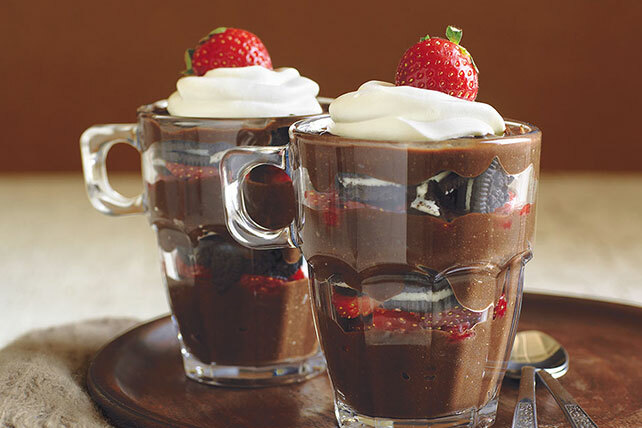 Fat-free milk and sugar-free pudding mix help make these Chocolate, Strawberry & Cookie Parfaits Healthy Living desserts. Beat pudding mix and milk in medium bowl with whisk 2 min. Refrigerate 5 min. Spoon 1/3 of the pudding mixture evenly into 4 mugs or parfait glasses; top with layers of half each of the berries and cookies. Repeat layers. Cover with remaining pudding mixture and COOL WHIP. Garnish parfaits with additional sliced strawberries. Parfaits can be made ahead of time. Store in refrigerator up to 2 hours before serving.